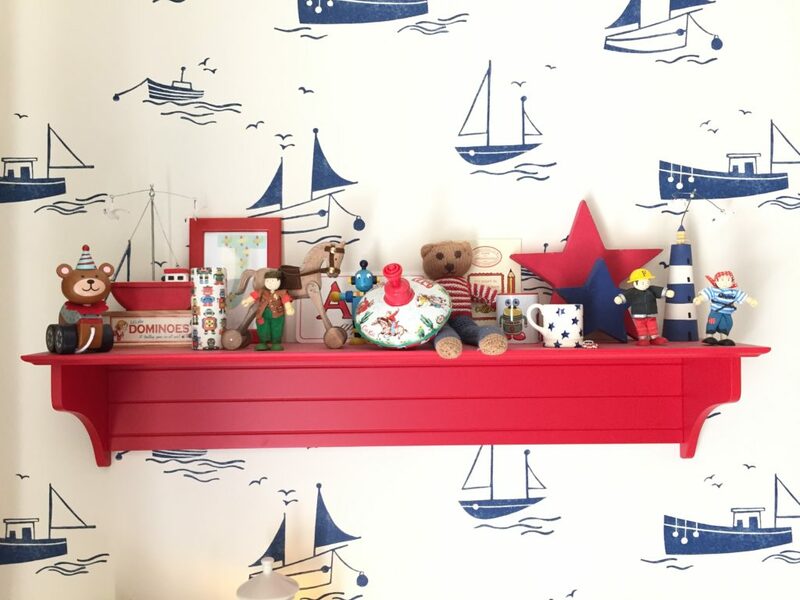 When Joshua was moving out of his little nursery into his big boy bedroom I knew I wanted a nautical theme and did lots of searching online for ideas. I initially found the Harlequin ‘Sail Away’ wallpaper and then based the rest of the room around it. 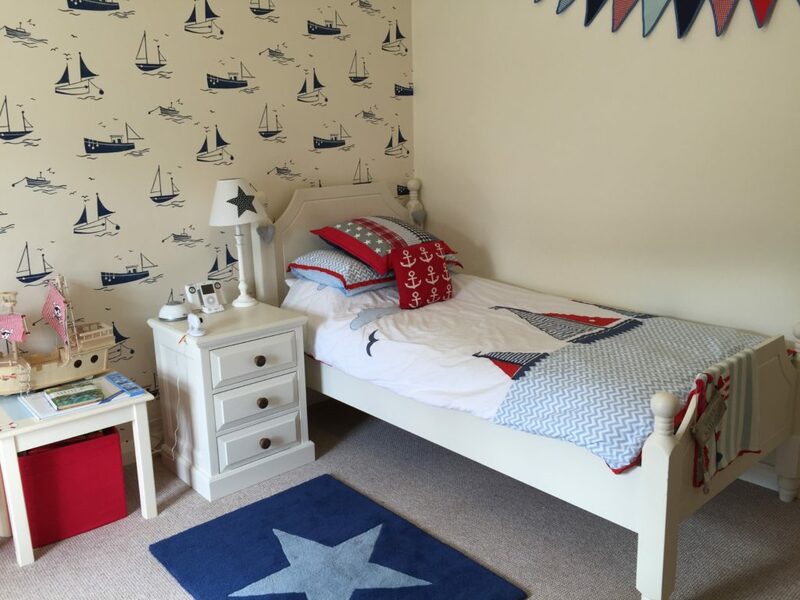 The red, white & blue striped curtains, nautical bedding and navy & white star rug were all from John Lewis and really brightened up the room. I had previously had a large unit made for my family room by a local company and was very impressed with the quality and finish of it so decided to have all the furniture made by the same company. 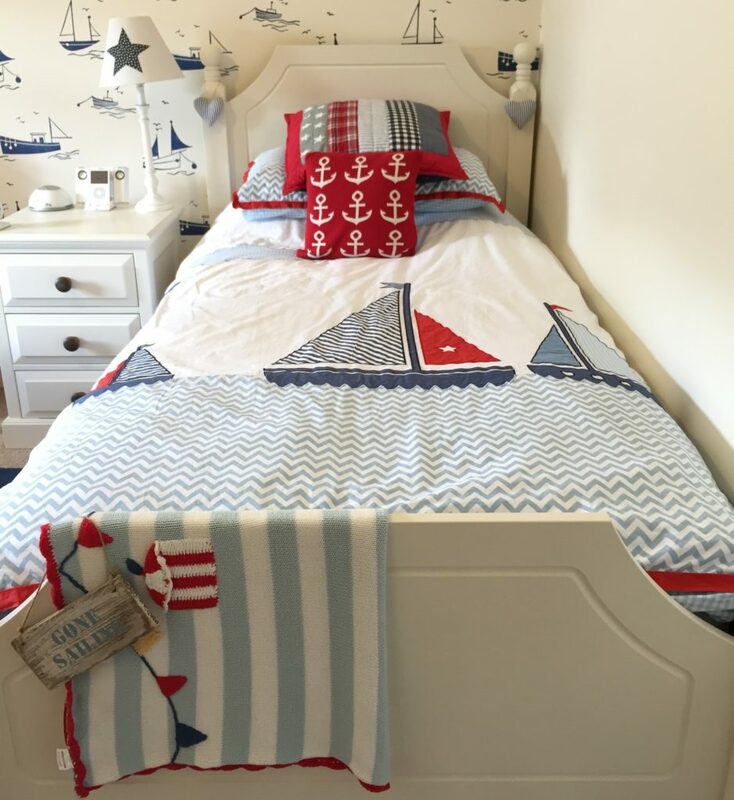 I decided on an off white painted finish with dark wooden handles and was really pleased with the end result, it is all very sturdy and the bed has had to stand up to plenty of bouncing from Joshua! 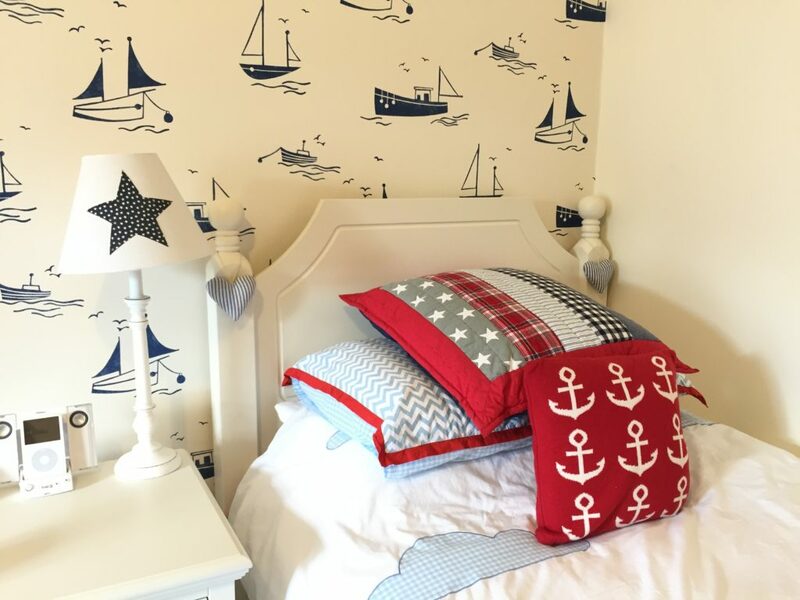 The star bedside lamp was a gift and the lighthouse light is from Dunelm, it is one of my favourite pieces in the room. 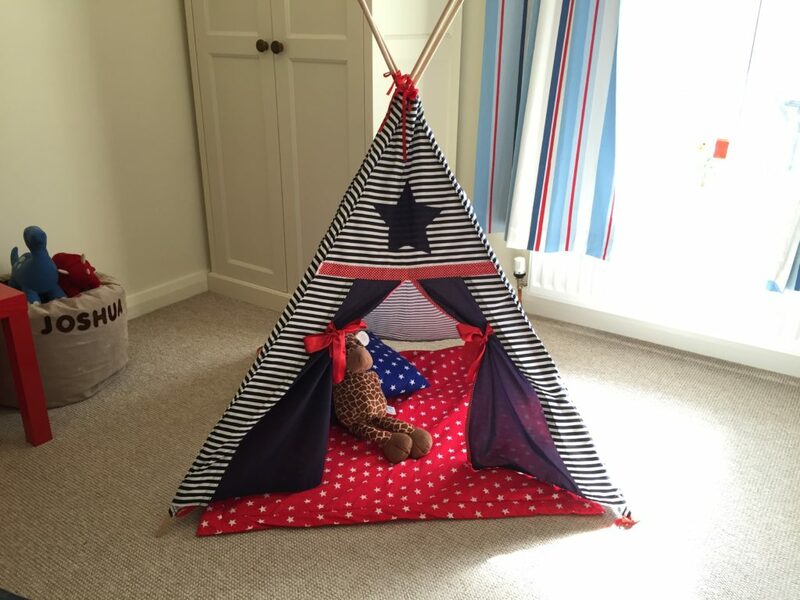 Every boy loves a tent and this teepee from Just for tiny people was a perfect match for the bedroom. 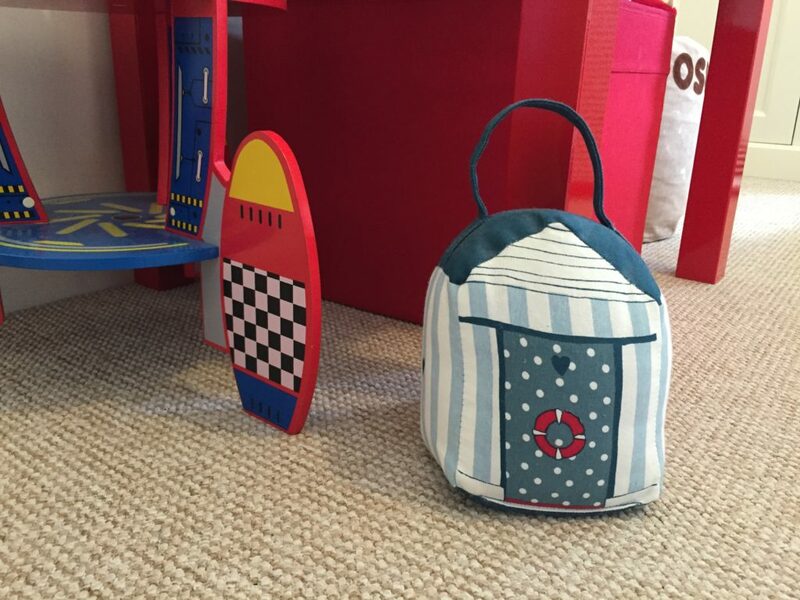 You can often find Joshua hiding in here! 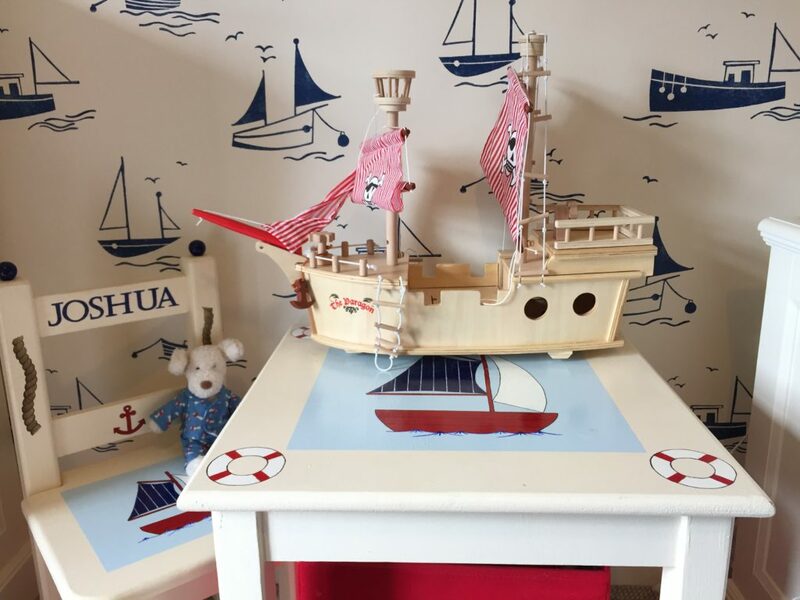 The little personalised table & chair was a Christmas gift from Joshua’s Nana & Papa a few years ago and fitted with the nautical theme perfectly. 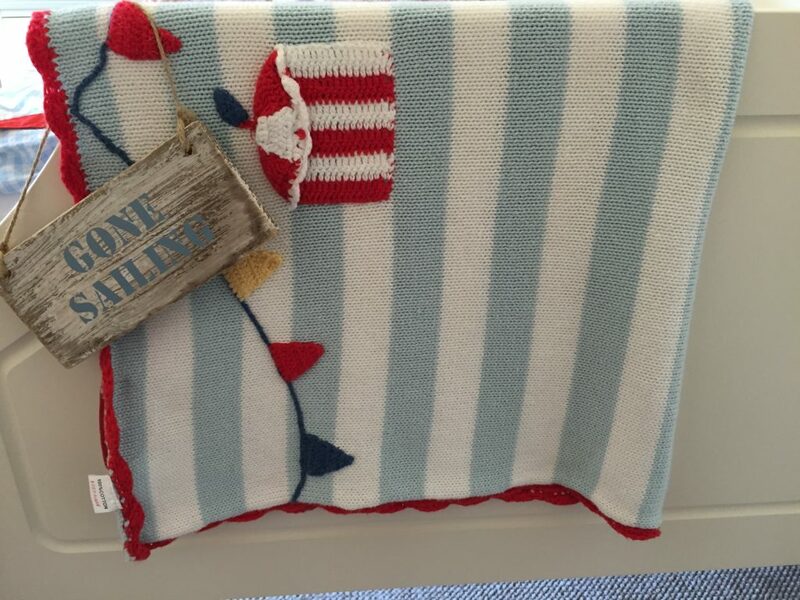 You can find similar from Not on the high street. 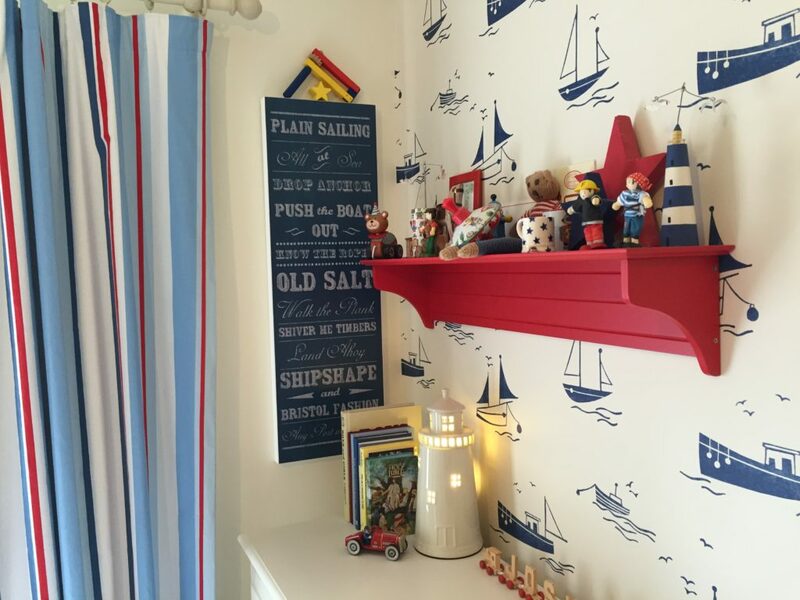 The blue canvas of nautical phrases & the door stop are from B&Q and I found the red wall shelf at Great Little Trading company. 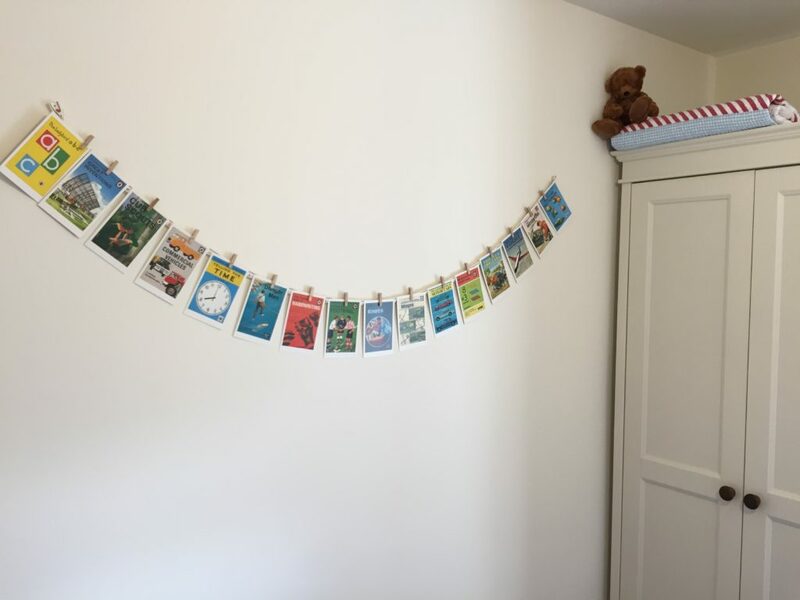 I hung some Laura Ashley bunting next to Joshua’s bed and also some vintage style ladybird postcards with little wooden pegs along the other wall. Joshua loves these and often asks questions about the pictures. 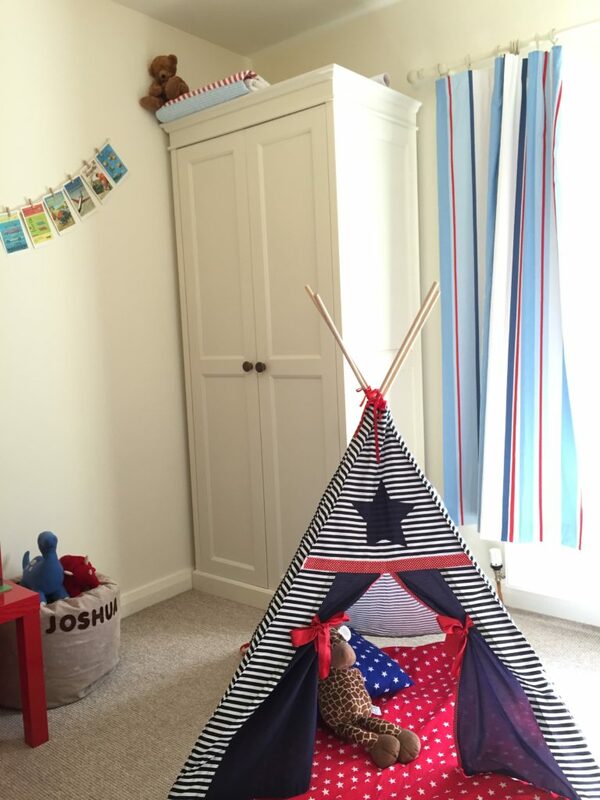 As space was running out in the toy room I moved a few of his things upstairs into Joshua’s bedroom. 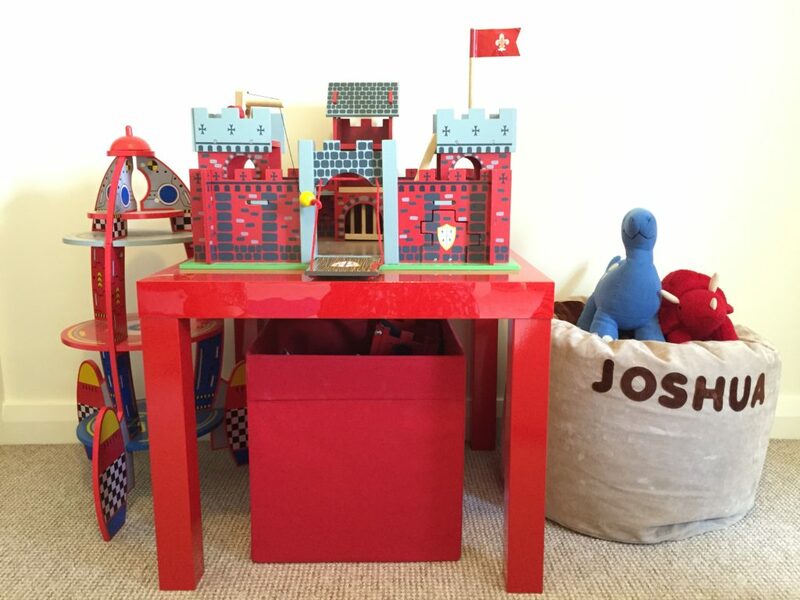 The little red table is a bargain from IKEA and is the perfect size for Joshua’s castle to sit on. Cushions are from John Lewis & Great Little Trading Company and the little blanket on the end of his bed was actually a baby present when he was born which I have always loved. It is by Powell Craft. 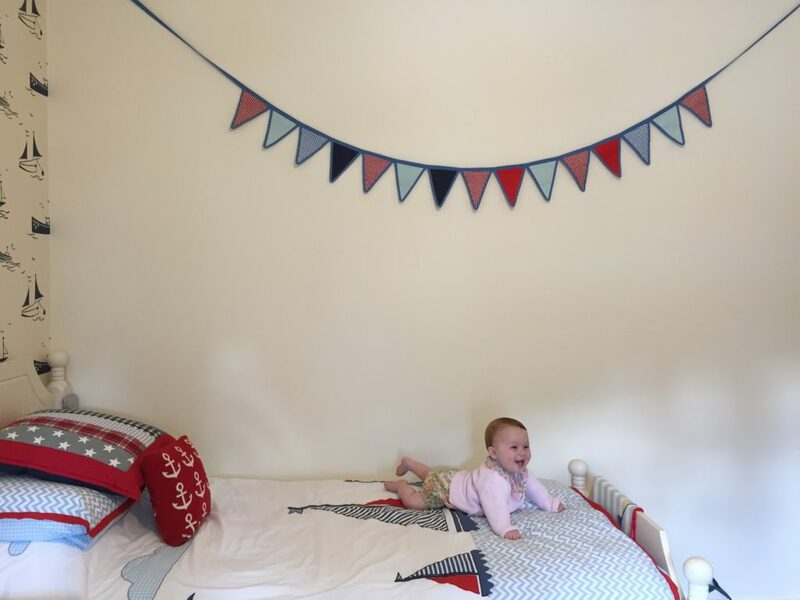 As you can see Lydia loves her big brother’s bedroom!